The traditional eating times (11am – 2pm, 5pm – 7pm) are some of the best to ride the park’s bigger and more popular attractions. If you can offset your meals by a few hours you’ll find yourself going on more attractions and having much more fun. 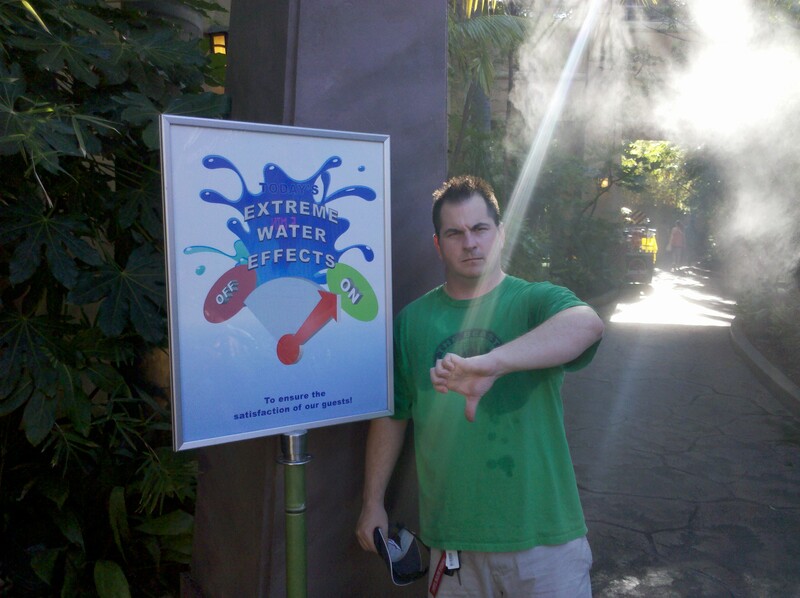 Your host is no fan of "extreme water effects"
Water rides traditionally get large lines during the hottest part of the day. If you don’t mind it being a little cooler, you can hop on these attractions just as the park opens. Night time or the half-hour before closing is also a perfect opportunity to tackle the water rides…but just be mindful that you might be driving home a bit moist! This can vary with each park, and when you visit. Check out each individual park’s section for a more detailed plan on tackling the, “big ticket attractions” of each park. General rule of thumb is that the newest, latest and greatest ride is best to ride at the start or very end of the day. Should I purchase a season pass or just purchase my tickets at the gate? A season pass is a good idea only if you’re going to visit the park multiple times a year (or are planning a trip to several parks in a national chain). One of the best ways to save time and money at amusement parks is to check their website. Most now offer the option to purchase discounted tickets online, which will almost always save you money versus paying for tickets at the main gate. Be sure to also check if any promotions are being run, such as bring a soda can in for discounts. Well, there you have it. The complete pre-planning guide to all theme parks, regardless of location. If you follow these steps and suggestions, you will not only save yourself money, but also get more for your money. Be sure to check Great American Thrills each week for these updates. You can even send us your ideas or thoughts too via WordPress! April 3, 2012 | Categories: Amusement Parks, Theme Parks | Tags: american thrills, amusement, amusement park, amusement parks, California, carnivals, carousel, cars, cedar fair, Cedar Point, coupons, fun, gas prices, great american thrills, insider, kris rowberry, kristopher rowberry, parking lots parking pass planning road trip roadtrip roller coaster rollercoaster roller coasters safety harnesses save money saving money six flags, planning vacation, rowberry, season pass, six flags, staycation, theme park, theme parks, thrills, tips, transportation, travel tip, trip, vacations | Comments Off on The Day Finally Arrives! Welcome, everyone…to Great American Thrills! This is the jumping off point, the start of what I hope to be a fun, rewarding experience for both readers, viewers and myself. Great American Thrills is much more than a blog…it is the result of years of visiting parks, learning everything about them, and then never being able to “squeeze the veritable sponge of theme park information” that is my brain.of things to come. If you’ve stumbled upon my little section of cyberspace, welcome. At least twice a week (sometimes more often when parks are open) you’ll find some nce tidbits and tips here to save you and your family money at your local theme park. All the while, you’ll also learn such things as: “Why can’t I wear my sunglasses on certain rides?” “Who invented the roller coaster?” and “If there was a Mr. Disney, was there a Mr. Flags?” (No, by the way). So just sit, back, pull down your lap bars and safety harnesses – and enjoy the ride!